3C-C.L.O.M.E.A. Control Systems : Bending Machines : J&S Machine, Inc.
CM100: Works in multi-run, basic electronic control that includes dual, four digit displays indicating the positions of the bottom rollers on the machine. Roller positions can be programmed to move incrementally to allow the operator to run the profile through the rollers in multiple passes to achieve and repeat a desired bend. CN111: Works in multi-run, electronically controlled by a micro-processor which can be operated manually, in semi-automatic, and automatic mode with the option to interrupt the work cycle to carry out checks. 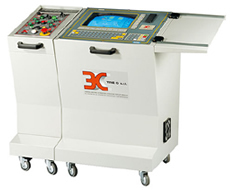 The software installed performs single radius bends or bends with three radii assuring correct repetition of the performance and the option to store in the memory up to 199 different single radius programs and 19 multi-radius programs. CN112: Works in a single pass or multi-pass mode, this version can have up to 36 steps per program with storage of 50 programs. Uses arc, roller quote, and positioning speed to determine the program. Works with a photocell, pneumatic encoder, and additional advanced functions such as Mini-Reset to increase productivity. CNC120*: Equipped with an industrial PC, 14" color monitor, and 3.5" floppy disk. Programs can work in multi-run on a single radius, or in one run with the option to store into memory up to 12 different bend radii on the same bar, directing and calculating automatically more than 500 positioning speeds, both in input and in the output, of the bending roller, in this way allowing the management of even complex geometry such as reduced arches, polygons or ellipses. 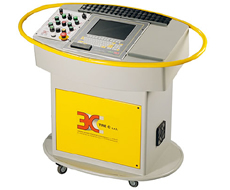 CNC233*: Equipped with an industrial PC, 12” color monitor, and 3.5” Floppy Drive. Performs processing in single run with the possibility to program bends with 36 different radii on the same bar and controls over 500 positioning speeds of the bending roller. 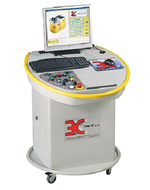 In addition to all the functions of the lower version controls, the CNC233 is capable of controlling and managing roller rotation speed automatically, allowing the performance of very small bending radii and speeding up processing in the event of large radii. CNW333*: Equipped with a Windows XP operating system, 40GB HD, 17” color TFT monitor, USB Drive, and a wired mouse & keyboard. It can operate in single and multi-run and is applied to hydraulic machines with a two-speed or servo controlled rotation motor. Files can be managed directly in DXF format in order to obtain the geometry of the desired bend. Networking capabilities for interfacing with other PCs for data exchange.